Five interlocking circles are emblematic of the five companies comprising the TECO Corporation, symbolizing unity. Four smaller circles are interconnected with the fifth. The piece is constructed of stainless steel, round tubing. Location: On front grounds., 109 Quinter Farm Rd. 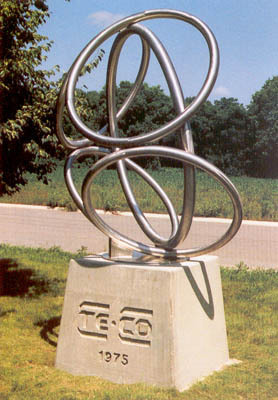 : “Unity Sculpture,” Ohio Outdoor Sculpture Inventory, accessed April 22, 2019, http://oosi.sculpturecenter.org/items/show/1051.